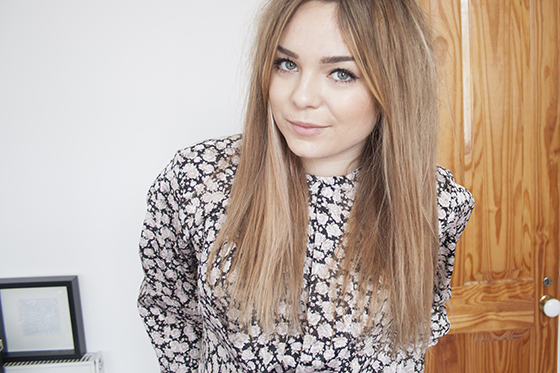 Heres the vintage shirt that I bought yesterday in Camden in all its glory! I really like it despite being floral. I just think floral is so overdone and can look really naff sometimes. But I think the fact this is monochrome (my usual!) it fits well with my usual wardrobe. It has a button up back but I decided to only do up the top two buttons because I quite like having my back on show when I have a high neck. Just shows a little bit of flesh as I think long sleeved shirts can often look a little prudish, especially when buttoned to the top. There is still a lot of love for my Zara heeled sandals which I bought last week. 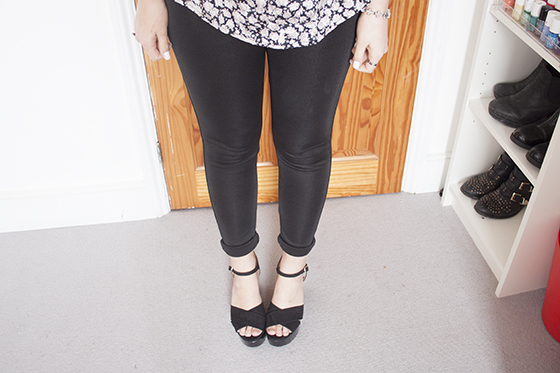 I love how spring-y they look in a outfit and add a different dimenson compared to my usual heeled boots! I made a outfit video to go alongside this which you can see towards the end of the images in this post or head over to my Youtube channel to see it on more detail! Remember to subscribe to my channel if you'd like to see more video stuff from me. I dont always post the videos I make on my blog and you dont want to miss out right? PS. How good is that Pharrell Williams and Daft Punk track? So funky! I've listened to it pretty much on repeat all day! I absolutely love your Zara heels! 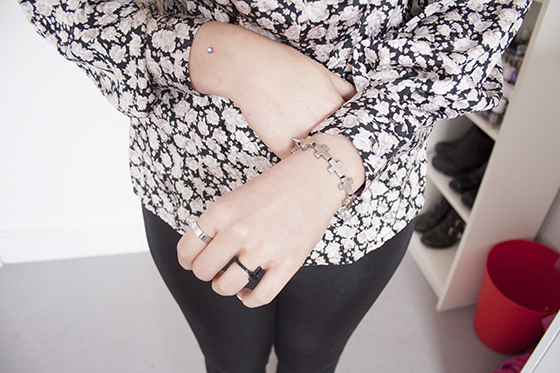 And your new dermal looks ace. I am obsessed with Get Lucky, I was obsessed with the loop before it came out and it did not disappoint! The shoes, ahhh. In love. literally listening to it as i type this!! I love it! Love the shirt - what a great find! I have the Topshop bag too...the little flappy bit in the middle drives me mad though! amazing look! love the detail in the back! I saw this bag in Topshop and walked away! the bag! NEED the bag! Love this outfit! 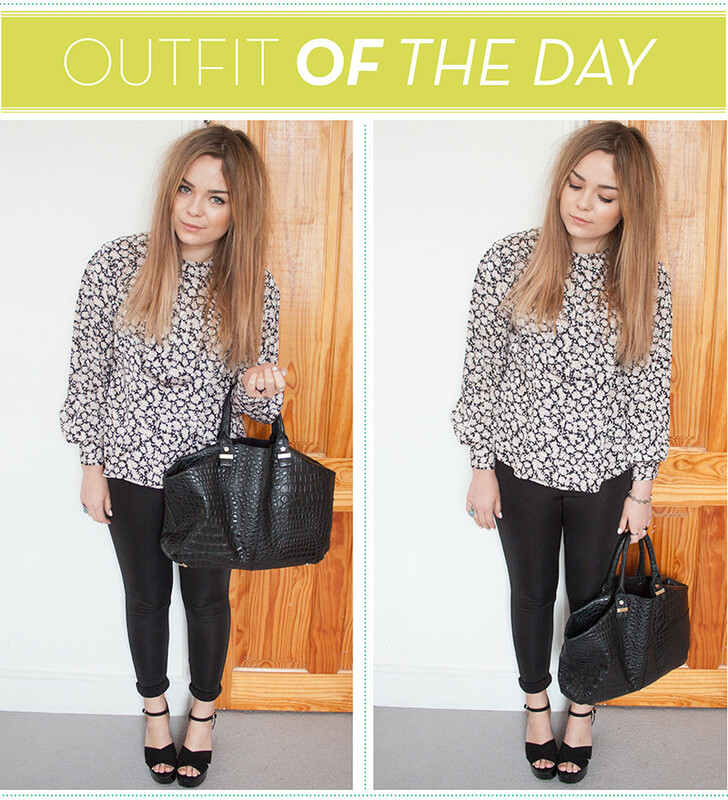 Especially the blouse, it's so cute! I think this might be one of my favourite outfits of yours. Love the shirt, its so unique! Suits you. Love the sandals too, i see you decided to keep them lol! they look great! Its print is really nice. I absolutely LOVE the back on that top. So cute! Very LLYMLRS. It rare you find a monochromatic floral print and I'm digging this one especially the back of it. The sandals and trousers are HOT. It should be AN outfit, not a outfit. I love your shoes Lily, they look amazing! Great outfit, love your style, esp the heels! Your site is very good about latest women accessories and girls shoes. I like your post keep it up. You definitely make me wanna get those Zara sandals.